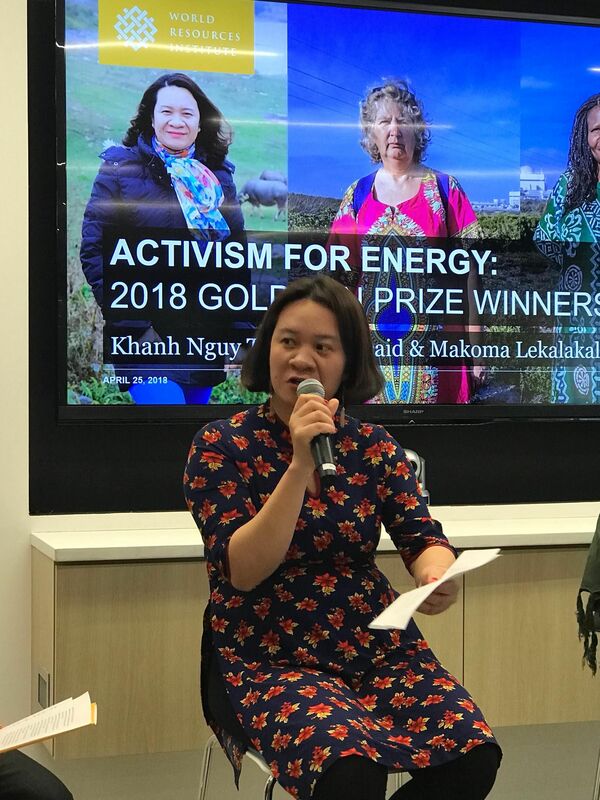 Vietnamese environmental activist Nguy Thi Khanh, co-founder and executive director of the Green Innovation and Development Centre Vietnam, was honored with the Goldman Environmental Prize. Lars Blume and Do Minh Tam from GreenID celebrate her work and explore Vietnam’s energy transition. 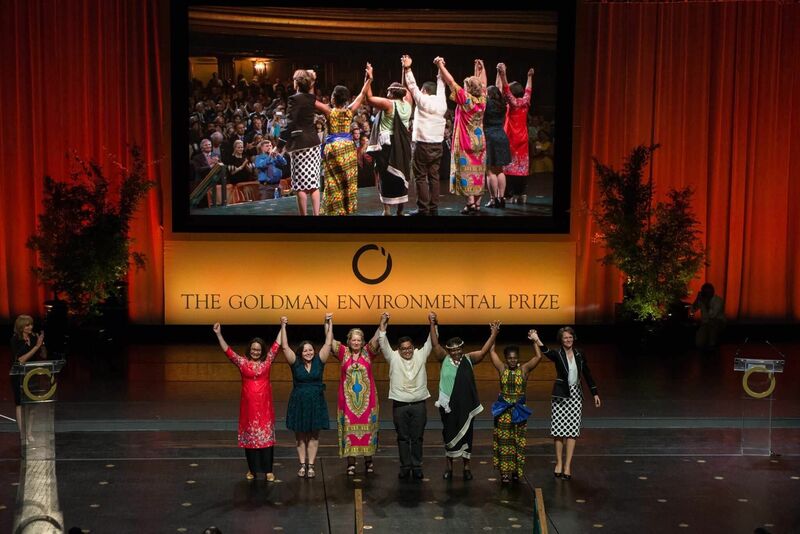 The Goldman Environmental Prize is one of the world’s most prestigious award honoring grassroot environmental activists. It is the first Goldman Prize for Vietnam and it brings important international recognition for progress in pushing for sustainable energy in Vietnam. Furthermore, in 2018 the world’s foremost environmental prize has announced more female winners than ever before (five out of six), recognizing the key function women are playing in defending the planet. The winners include South African anti-nuclear activists Makoma Lekalakala and Liz McDaid, Vietnamese clean energy advocate Nguy Thi Khanh, US clean water defender LeeAnne Walters, and French marine life champion Claire Nouvian. The only male winner is anti-lead campaigner Manny Calonzo from the Philippines. The Goldman Environmental Prize gives hope and time to pause for one night and gain new power for whatever comes next. The prize ceremony reminds us of what it takes to protect our planet; all 2018 winners follow different approaches for different environmental problems. Fitting to the individual context, all are answering the following questions: What does it take to halt air pollution, to shut down a destructive coal mine, to clean up a toxic waste site? What does it take to restore clean water for your community, to safeguard our ocean’s resource, to save an endangered species, to protect a virgin forest when you have no political clout? What does it take to resist when the opposition seems insurmountable? Sometimes it takes just one person who becomes many and then becomes a movement. It takes one of us and all of us! The one of us from Vietnam is Ms. Nguy Thi Khanh. She was nominated for her work to slow down coal power expansion in Vietnam. For Khanh, Vietnam’s energy future is at a crossroads and every decision and every dollar invested today will be felt in Vietnam and in our earth’s climate for decades to come. When the Vietnamese National Assembly decided not to pursue nuclear power in 2016, Khanh and GreenID saw that changes for the better are achievable. Born into a rural family in Bac Am, a village in northern Vietnam, and growing up near a coal plant, Ms. Khanh experienced the pollution and dust from coal operations firsthand and witnessed many people in her community developing cancer as a result. She was always passionate about the environment and after graduating from college began working on water conservation issues and community development for a small Vietnamese nonprofit organization. In 2011, Ms. Khanh founded Green Innovation and Development Centre (GreenID) in order to promote sustainable energy development in Vietnam, as well as good water and air governance and green development. She also established the Vietnam Sustainable Energy Alliance (VSEA), a network of 11 Vietnamese and international environmental and social organizations that collaborate on regional energy issues. GreenID helped develop local energy plans to both support the uptake of renewable technologies and manage pollution. This helped households and entire communities to minimize pollution of rivers, turn waste into energy, and acquire new, affordable technologies such as solar lights and worm farms. The success of the work has shown that there are very real, effective and affordable alternatives to energy from large hydropower and coal-fired power. The positive changes of the past prove that we can achieve a lot when nonprofits, scientists, and state agencies work together. Today, the question for Vietnam is how to leapfrog a twentieth century energy model based on coal and large hydropower and take advantage of low cost and abundant renewable energy that will guarantee Vietnam’s future energy independence and safeguard our air, water and the earth. The next two years are critical for Vietnam, and the international community will play an important role. In 2020, Vietnam will officially launch its newest power development plan. GreenID’s goal is to reduce coal’s share in favor of clean energy for people’s health and long-term sustainable development. Vietnam’s environmental movement calls on global governments and corporations to stop investing in coal in Vietnam and help the country move away from a high carbon future. There are many good investment opportunities in renewable energy and energy efficiency in Vietnam. It is good for the country and essential for our world. We cannot create a second earth, so fostering an energy transition more quickly is essential for us and our children. GreenID’s team met relevant partners and joins key conferences in Southeast Asia as well as global events. On regional level, GreenID together with Heinrich-Böll-Stiftung’s office in Southeast Asia established a regional platform for relevant civil society partners of ASEAN countries to share, gain a better understanding and learn from each other. Keeping knowledge up to date and bringing external information and good practice examples back into the national discussion is the main goal of this regional network. GreenID will continue demonstrating the success of renewable energy technologies with governmental, university and international partners, and all local partners across Vietnam. Only together, a new long-term energy vision that is powered by renewable energy and beyond coal is possible. More information about GreenID’s important work is summed up in the organizational annual report 2017 or in this podcast with prize winner Ms. Khanh. Lars Blume and Do Minh Tam work for GreenID, a Vietnamese non-profit organization that works to promote sustainable development in Vietnam and the larger Mekong region.